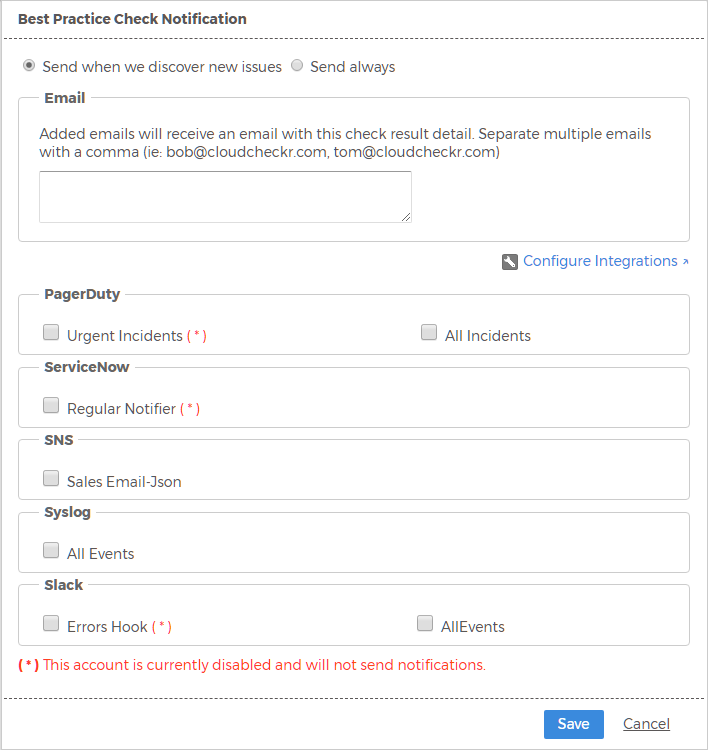 This feature allows to configure email notifications to send to selected users that they will receive each time new issues are discovered with a best practice check. You can also configure the application to send notifications daily regardless if new issues are discovered or not. Click the Notifications icon next to a selected best practice check. The Best Practice Check Notification dialog box opens. Type email addresses for each recipient and separate the addresses with a comma. In the Syslog section, provide the host name and port of your syslog server. Under the ServiceNow section, select the account where you want to apply these notification settings. A pop-up indicates that your email setting was saved successfully. If you have not configured your integration, click Configure Integrations.